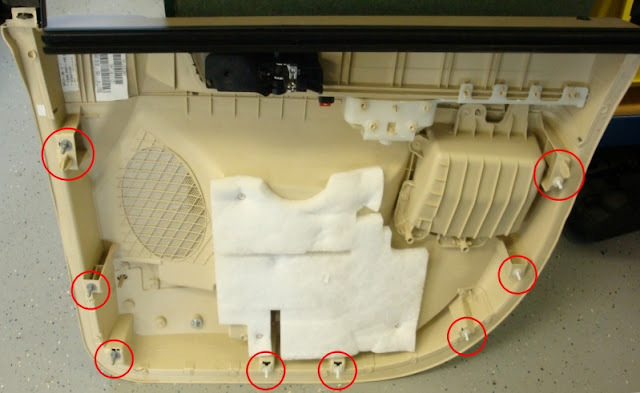 I have a new lock actuator coming and can't seem to figure out a safe way to remove the interior door panel on my 2010 Town & Country. Usually I can find a Video online, but no luck so far. I have seen some videos for older years, but the door panels look different. Are there just plastic clips holding the panel on? Any hidden screws I should be aware of? Hopefully someone can help me. To remove the door panel you need to remove the black plastic trim piece near the mirror (just pulls off) and remove the two screws that hold the panel on, one behind the door handle and one below the door grab handle (both screws have plastic covers that need to be pried off). Then you need to pry the door panel off, I recommend using a plastic trim tool to prevent breaking the fasteners. Last edited by georgef; 01-07-2019 at 03:28 PM. Thanks so much for the quick response. I will give it a try. The picture will be a great help.